In the fall of 1989 Swedish press started writing about a band called TV POP CRISIS who got signed to Blast First. A completely unknown band from the small town of Jönköping (which also is the hometown of Cardigans) on the same label as bands like Donic Youth, Dinosaur JR and Sun Ra. TV POP CRISIS decided to change their name, and after a listener competition i swedish national radio station P3 they were now answering to the name EASY. They released their debut single Castle Train/Cloud Chamber in late summer 1990 but even before it got released EASY was the subject of a big hype ran by magazines such as NME as well as all imprtant swedish press. The LP Magic Seed followed and EASY was on everyones lips and singles like Horoscope even made it to the charts, EASY played a lot of festivals that year and last year, some ten years later, their show at swedish Hultsfredfestivalen was named a classic by swedish magazine Pop (the most influential swedish muscpaper to this date). Later during the year when EASY had started to work on the follow-up luck turned against them. Rough Trade, who distributed Blast First, went out of business and after they got bored of all the waiting EASY decided to leave Blast First. The second album Sun Years saw daylight 1994, when EASY got signed to SNAP, a sublabel of swedish classic MNW, and recieved rave reviews. The singles Never Seen A Star and Listen To The Bells had heavy rotation on swedish radio but the Blast First thing kinda took the spark out of the band and they decided to call it quits. The singer, Johan Holmlund, had started to take interest in electronic music and together with Quant who've hade some fine releases on the highly acclaimed label Dot. After a while two members from EASY joined, Anders Petersson and Rikard Jormin. Guitarist Fredrik Lindson and keyboardplayer Per Sjörs also joined the forces and they started to perform liveshows under the name FLY. The got signed to Dolores/Virgin, recorded an album, Green Lights, and the first single Bad Karma Sky got mentioned song of the year in sedish magazine Nöjesguiden. Then again luck turned against them. It seems to be both labels and artists called FLY so they decided to go back to EASY. But all this name-changing-stuff and Green Lights isn't properly promoted by the label. But EASY continues to write material and in 2001 a cassette reaches Joakim Wallström, A&R at A West Side Fabrication, who've had some swedish stand out releases from bands such as The Wannadies and Sahara Hotnights among others. He offers EASY a deal and once again they're back in biz. 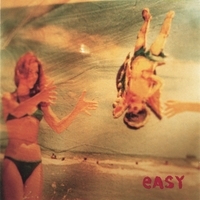 During the spring the single Kiss Kiss is released and that's proof enough that EASY is still very much to count on. They've recorded and produced the album themselfs along with a couple of friends such as Pop-Lars, C. Silver and Björn Olsson. And it's time to start writing a new chapter in the career of EASY.